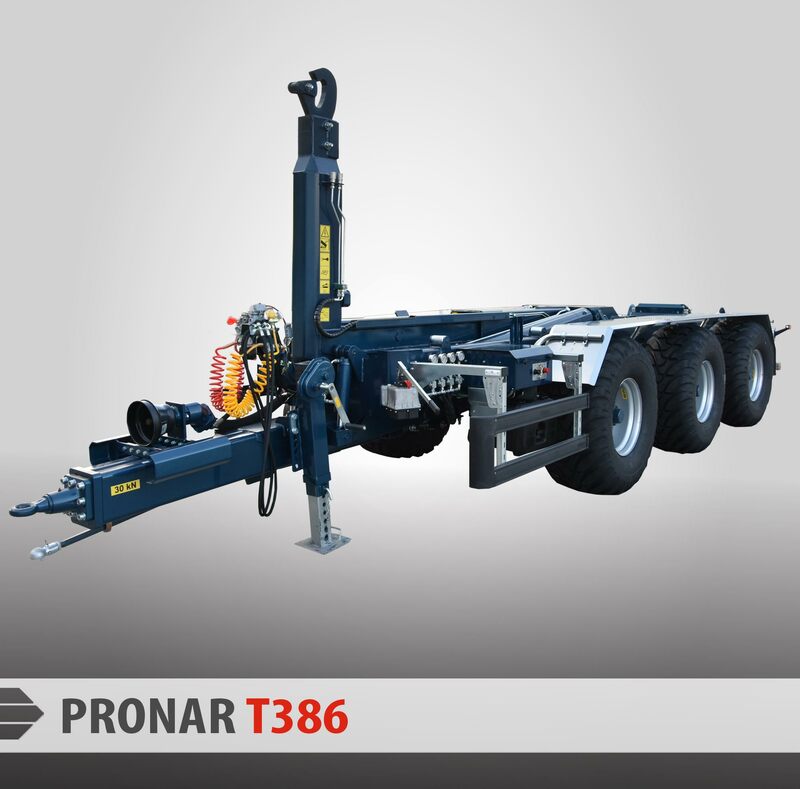 PRONAR trailer T386 - Pronar Sp. z o.o. 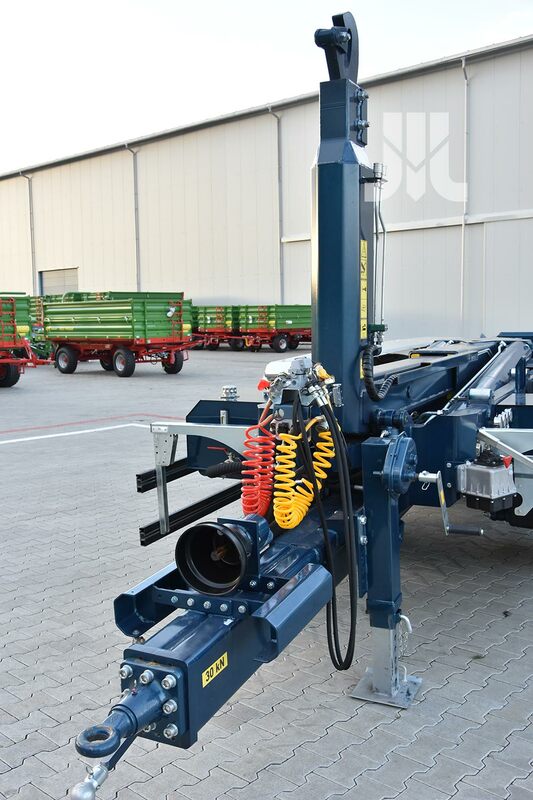 Hook lift trailer PRONAR T386 can be used for many different tasks in areas of agriculture, construction, municipal or horticulture. It is a practical way to collect, transport and unload various types of containers between 5 to 7.5 m like box containers, tanks, flat, dumpers, and many others. 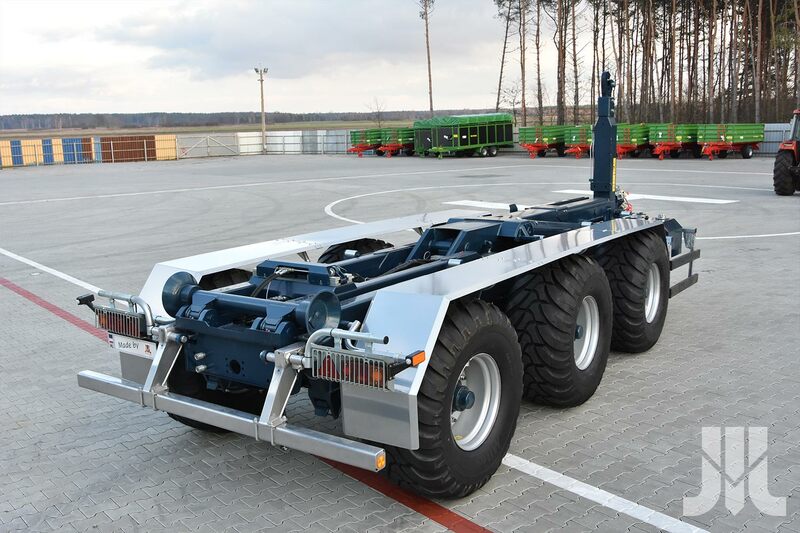 Multifunctionality of the hook lift trailer and its various applications have direct effect on productivity and lower investment and operating costs. 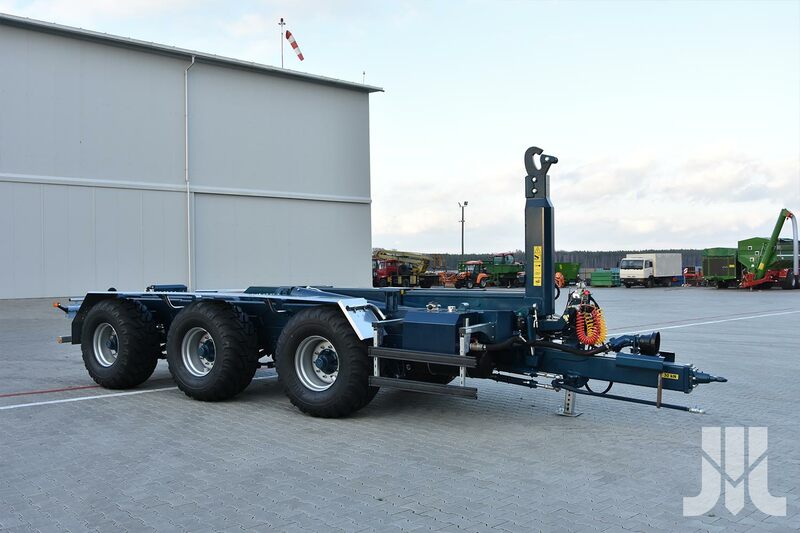 The lower frame of the trailer is made of durable steel profiles additionally reinforced with flat bars to ensure the durability and rigidity of the structure. 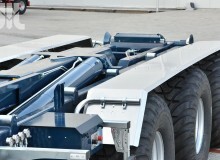 The chassis consists of mechanical suspension tridem type with sprung steel springs, and three axles of which the first and the third are actively steered axles. The loading system consists of three cooperating frames made of closed steel profiles. 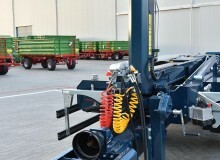 Unlike in other loading systems used in PRONAR trailers, towing hook frame has telescopic folding by using a hydraulic cylinder. 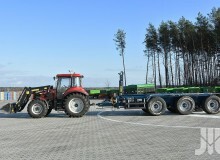 This solution enables variable settings of the center of gravity of the carried container what increases or decreases the burden of the rear wheels of the tractor. The hydraulically adjustable and amortized drawbar allows smooth adjustment of the drawbar hitch to the tractor hitch. 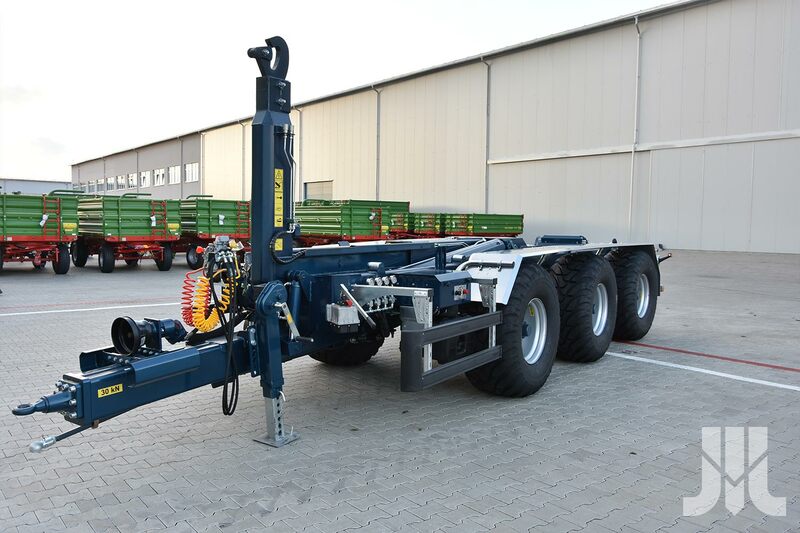 The hydraulic cylinders mounted on the drawbar protect frames against vibrations and shocks generated during operation of the trailer. 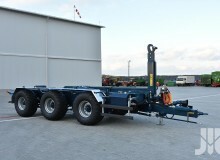 PRONAR T386 trailer can be used both for transporting containers and as a normal tipper trailer with loaded container. Switching between functions is done automatically. 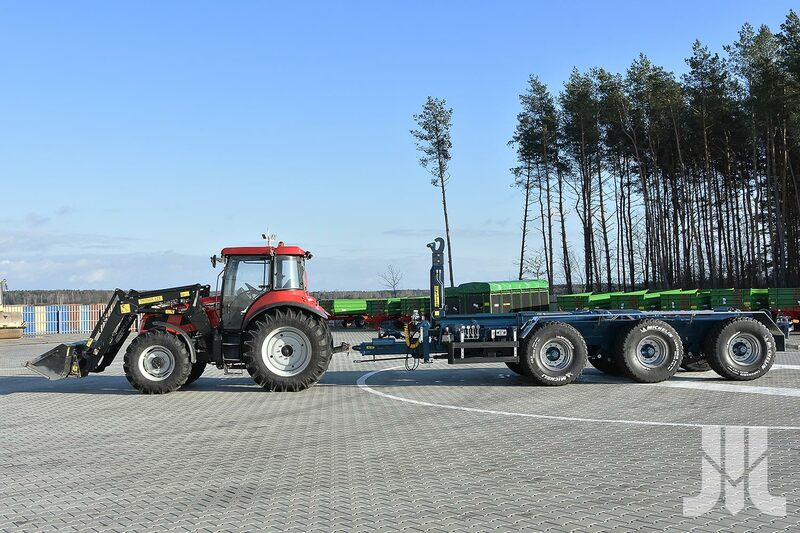 The trailer is equipped with its own oil tank and efficient oil pump powered by the tractor PTO shaft in order to shorten the duration of the individual cycles and increase the strength of the actuators. The process of loading and unloading or tipping (depending on mode) is carried out by two hydraulic cylinders. This solution is used in automobile versions of hook trailers. Both cylinders at the same time lift up the container, so it seamlessly runs loading and its unloading. Each tipping cylinder is equipped with a brake that in the last phase of the folding reduces the scrolling speed of the trailer frames. On the rear frame the hydraulic container lock is mounted, which secure the container from slipping and jumping during the container transportation. In contrast to the mechanical container lock the hydraulic lock requires no changes to the lock position hooking points when you change the length of the transported container. 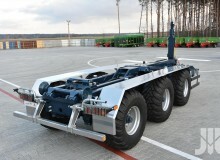 PRONAR T386 trailer like the previous model of hook trailer (T286) is equipped with rear bumper which is operated with two hydraulic cylinders. 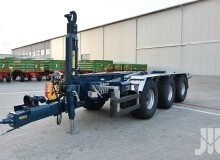 All hydraulic cylinders are controlled by a hydraulic distributor, which is in standard equipment of the trailer. 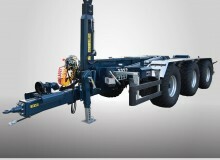 To increase the comfort and work efficiency the hydraulic distributor is operated with an electric control panel equipped with LEDs indicating to the operator the current settings and trailer frames position. 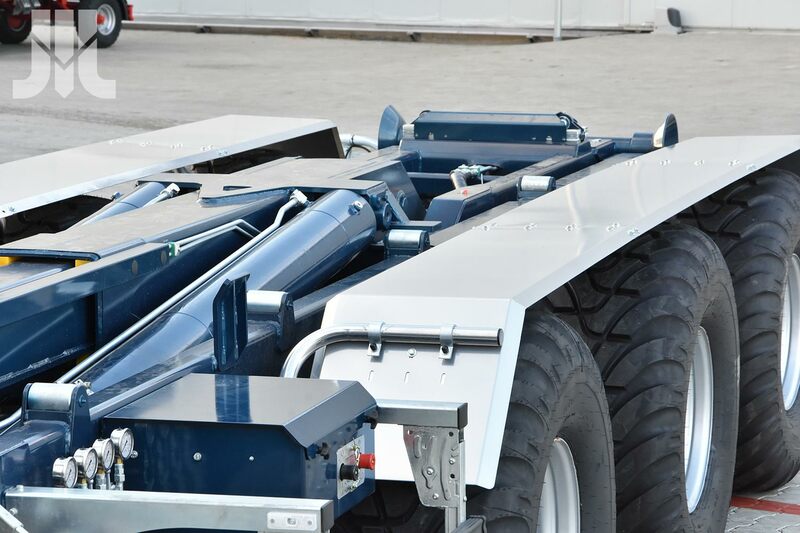 The control module on the basis of signals receiving from the sensors mounted on the trailer is monitoring all the time if the various functions of the trailer were switched on in the correct order to avoid damage to the trailer or container. Tridem suspension with 1810 mm axle base with fixed middle axle and active steering of front and rear axles, drum brakes 400×140. “Central hydraulic system with own hydraulic tank, hydraulic pump driven by PTO shaft, with electro-hydraulic security system powered by wires.